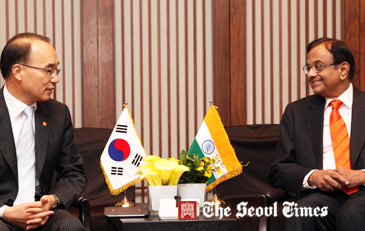 India’s Finance Minister P. Chidambaram (right) talks with South Korean Minister of Strategy and Finance Bahk Jae-Wan in Seoul. Mr. P. Chidambaram, finance minister of India, visited the Republic of Korea from Nov. 2-3, 2012 to hold the 3rd India-Korea Finance Ministers’ Meeting in Seoul. He met the Minister of Strategy and Finance Bahk Jae_Wan on Nov. 2, 2012 held wide-ranging discussions on financial and economic matters of bilateral concern as well as on relevant regional and international developments. Minister Chidambaram was accompanied by a high-level delegation from India comprising senior officials from the Ministry of Finance, tax experts, and also a senior representative of the EXIM Bank of India. The second meeting of the Finance Ministers of the two countries was held in New Delhi in January 2011 when the former Minister of Finance and Strategy of Korea had visited India. Mr. Chidambaram congratulated Minister Bahk on Korea’s successful effort to host the Global Climate Fund, and assured him of India’s wholehearted support in launching the Fund. The two ministers recognized the immense potential that exists between the two countries for greater investment and trade flows, and agreed to work towards realizing this potential. They particularly referred to the Comprehensive Economic Partnership Agreement (CEPA) which had resulted in 70% growth in bilateral trade in 2 years since its implementation in January 2010, and expressed determination to make cooperative and concerted efforts to achieve the target of $40 billion by 2015 set during the visit of India’s Prime Minister Dr. Manmohan Singh to Korea in March 2012. The two sides exchanged views on macro-economic outlook, and explored ways and policy directions to strengthen their cooperation further. During delegation level talks, the discussions covered extensive areas including fiscal policy, taxation, customs clearance, public procurement and infrastructure cooperation. The two sides agreed to sign a Memorandum of Understanding in the near future aimed at institutionalizing the cooperation between the finance ministries of the two countries and benefiting from sharing of their experiences and best practices. Later Minister Chidambaram held a business interactive session with top CEOs of Korean industry organized by the Federation of Korean Industries (FKI). The minister underlined the strength and growth potential of the Indian economy and invited the Korean businesses and industries to invest more in the Indian market, particularly in Indian infrastructure sector.